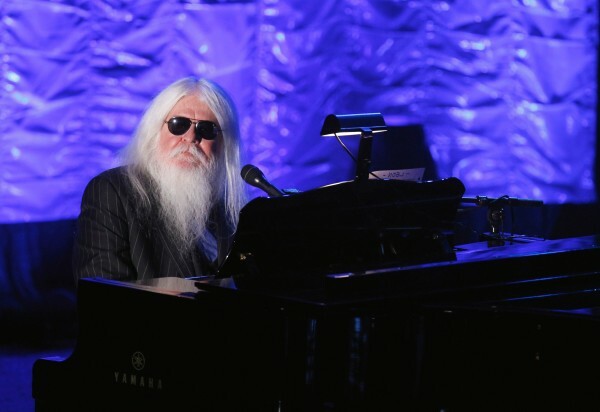 Leon Russell performs during the Songwriters Hall of Fame awards in New York, June 16, 2011. Russell died Sunday at age 74, according to a statement from his wife posted on his website. Leon Russell, who emerged in the 1970s as one of rock ’n’ roll’s most dynamic performers and songwriters after playing anonymously on dozens of pop hits as a much-in-demand studio pianist in the 1960s, died Sunday at the age of 74, according to his website. Russell, who was inducted into the Rock and Roll Hall of Fame in 2011, died in his sleep in Nashville, his wife said in a statement on the website. Russell had endured health problems in his later years, undergoing surgery to stop leaking brain fluid in 2010 and suffering a heart attack in July. “He was my biggest influence as a piano player, a singer and a songwriter,” John told ABC News. Russell recorded more than 35 albums and also excelled as a songwriter for other performers. His “A Song for You” was recorded by Joe Cocker, the Carpenters, the Temptations, Neil Diamond, Lou Rawls, Dusty Springfield, Ray Charles, Aretha Franklin and his good friend Willie Nelson. The Carpenters, Reddy, Shirley Bassey, Robert Goulet and George Benson all covered Russell’s “This Masquerade,” with Benson’s version winning the 1976 Grammy as record of the year. Russell was known as “the master of space and time” in his heyday during the 1970s. He wore a cocked top hat and, with salt-and-pepper hair past his shoulders and a beard that reached his chest, created an inscrutable image that was equal parts shaman, tent revival preacher and cosmic ringmaster. He ruled the stage with piano-banging abandon and, backed by a multi-piece band and a backup chorus, put on a show that was a roiling stew of rock, soul, gospel and country. He was born Claude Russell Bridges on April 2, 1942, and grew up around Tulsa, Oklahoma. He was playing in bars at age 14 and joined a band that included J.J. Cale, who also would go on to music stardom. Russell moved to Los Angeles as American music was taking a new shape. He became part of a talented pool of studio musicians known informally as the Wrecking Crew who provided back up for pop and rock hits of the early and mid-1960s, including those by Jan and Dean, the Beach Boys, the Monkees and the Byrds. Russell also was part of producer Phil Spector’s trademark “Wall of Sound” recording team. He eased into the spotlight in 1970 as a driving force on Joe Cocker’s landmark Mad Dogs and Englishmen tour. Russell assembled the 20-piece band, which came with a legion of hangers-on, and he served as its leader on a riotous two-month tour of the United States that spawned a double-disc live album and a documentary film. His work with Cocker, an appearance in the film about George Harrison’s 1971 “Concert for Bangladesh” and his first solo album, which featured contributions from three Rolling Stones and two Beatles, made Russell a star in his own right in 1970. In 1969, Russell and Denny Cordell started Shelter Records, which put out recordings by Russell, Cale, Freddie King, Tom Petty and the Heartbreakers, and Phoebe Snow. After his rock stardom faded, Russell adopted the alter ego of Hank Wilson for several albums of country classics that let him turn loose his Oklahoma twang. Russell, who had to have surgery because of leaking brain fluid a week before going into the studio, said it was the first time he had heard from John in 35 years. “If Leon can get the accolades he deserves and be financially OK for the rest of his life, I will have done something decent with my music,” John told The New York Times. The Russell-written song “If It Wasn’t for Bad” off “The Union” received a Grammy nomination.